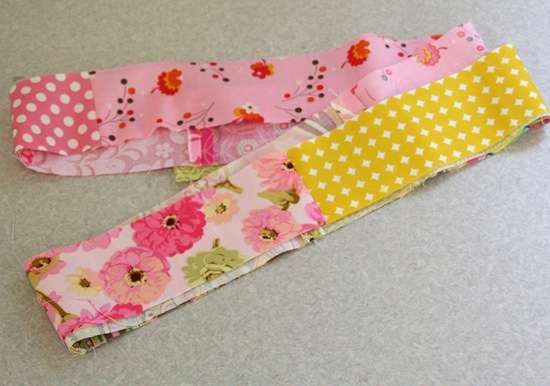 – 2.5” wide scraps of fabric in whatever colors your heart desires cut to various lengths. Mine were 3″ long to 14″ long. For fabric I used my leftover binding strips. My strips added up in length to about 2 yards, which made me a 5″ flower. Add or take away strips or cut them shorter if you want a bigger or smaller flower. Shorter strips and more of them will make a more colorful flower. – A sewing machine and a needle and thread. 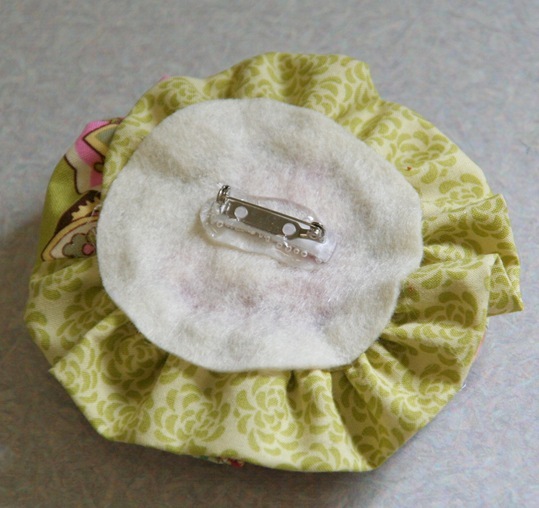 -A piece of felt or other strong fabric, a hot glue gun, and a broach bracket. Here are my various 2.5″ wide strips. Put them in order from the color you want in the center of the flower, to the outside of the flower. Now sew them all together end to end, and press seams open. 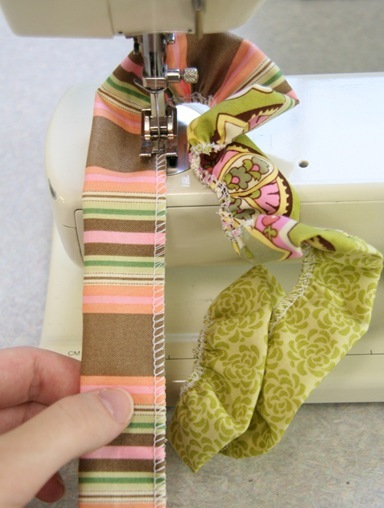 Now folding your strip in half as you go, serge OR sew a zig zag stitch down the raw edges. Do the same on the ends. **** I tried this gathering method on a computerized machine first and it would NOT work. When I switched to the older, manual machine it worked like a charm. 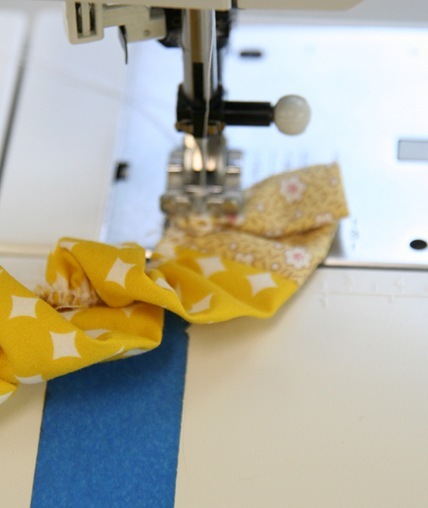 So if this method isn’t working on your machine…you can either gather it by hand by folding and scrunching the sewn edge as you sew over it, or use a gathering foot. 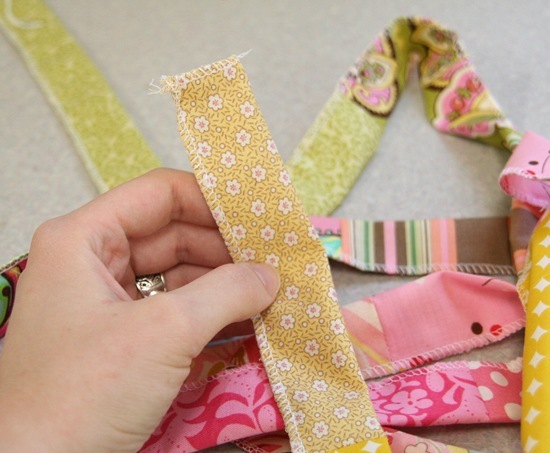 Because the strip is so long it won’t work to sew down it with a large stitch length and pull the bottom thread. Starting with the end you want as the center of the flower, fold the raw edge down and make the center of the flower by folding the strip around it. Sew in place either by hand or machine with a few stitches. 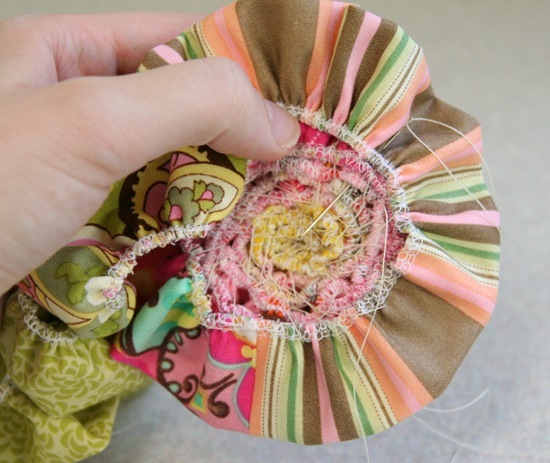 Continue to wrap the sewn/serged edges around the center, securing the edges to the center with your needle and thread. I put the needle and thread all the way through the center for the first few layers. As you continue adding the layers the center will have a tendency to stick out, but try to keep the sewn edges lined up and flat. Also as you add more and more layers, you can secure the layers to the previous layers with a stitch every half inch or so. If you secure the layers loosely to the previous layer, you’ll get a better result. This takes a little bit of practice, but I’m also quite possibly the worst hand sewer ever, so chances are you’ll do it perfectly the first time. When you get to the end, or the flower is as big as you want it, cut off the end and tuck the end to the back. Secure it with a stitch and knot your thread off. Make sure your flower is just right and poke the center down a little if its sticking up too much to make the back flat. Cut a circle out of your felt, just big enough to cover all of the sewn / serged edges. 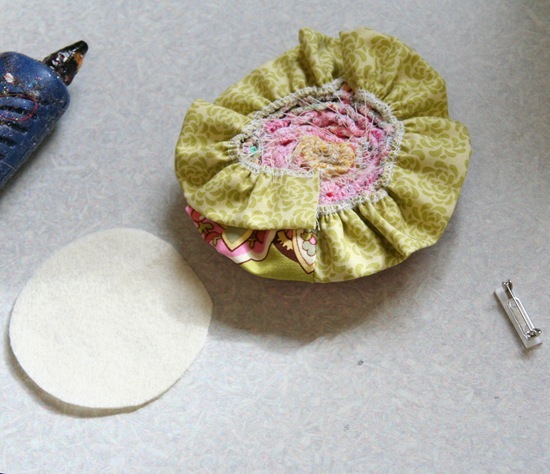 With your hot glue gun, cover the backside of your flower with glue, then press the felt onto the back. And there you have it, your cute scrappy flower you can attach to just about anything. The first attempt was made out of my left over border strips from the chain quilt. It involved some trial and error with the hand sewing….so it looks a little more bunched. 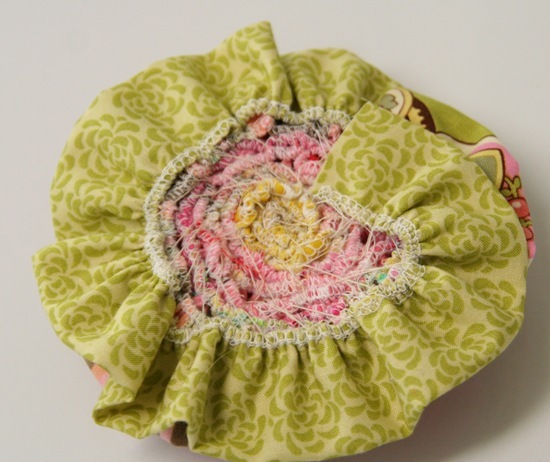 If you need another broach made from scraps….last year I made this circle one that I still love. this is so cute…i really like the white one. Great instructions! Very clear and concise. Thank you, I can’t wait to give it a try. Your style in that bottom photo is to die for! Thanks for this tute! I can't wait to make one! 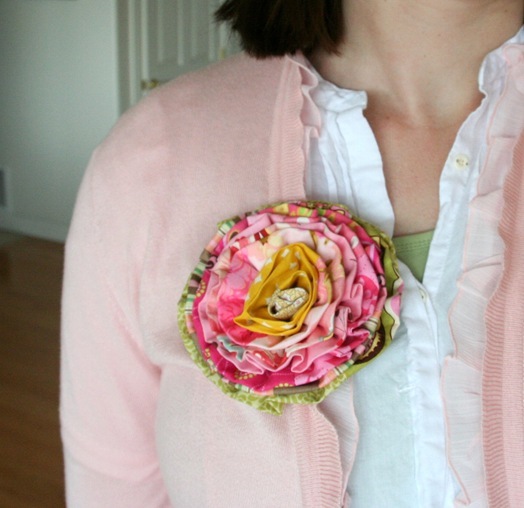 That's such a cute corsage! And a great tutorial too – it's sitting on my (slightly endless, I must admit) To Do list right now. very cute! i love making flowers like this! This is beyond fabulous! I'm going to have to make one too! Thanks for the tutorial! Well done! You rock! Happy sewing! 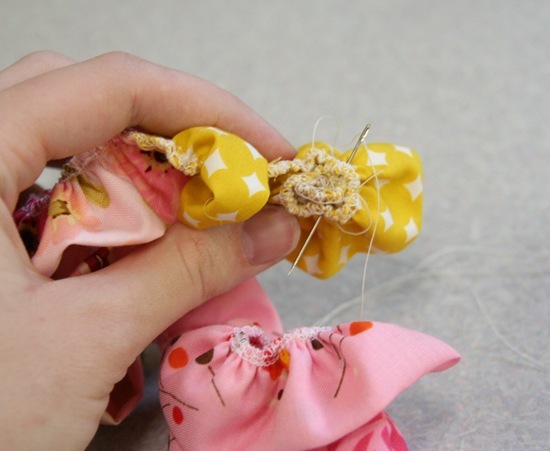 This is one of the best, most detailed fabric flower tutorials I have seen! Nice work! And thanks for sharing. Love this tutorial. It is so cute!!! I'm definitely going to try this. How perfect on the strap of a summer tank top? Scared to show my 13 yr old, she won't stop making them once I do! 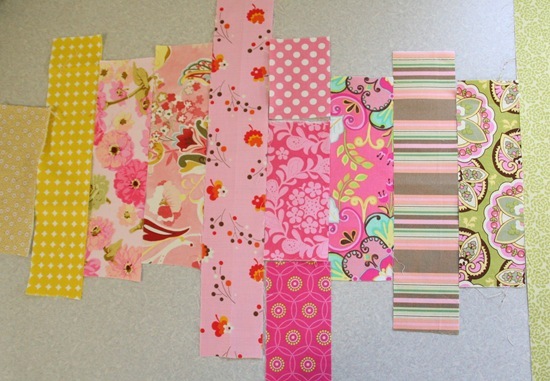 Nice idea – a fun way to use up scraps! Very pretty! Thankyou for such great instructions, I think I will have to try making one! Great tutorial- thanks! 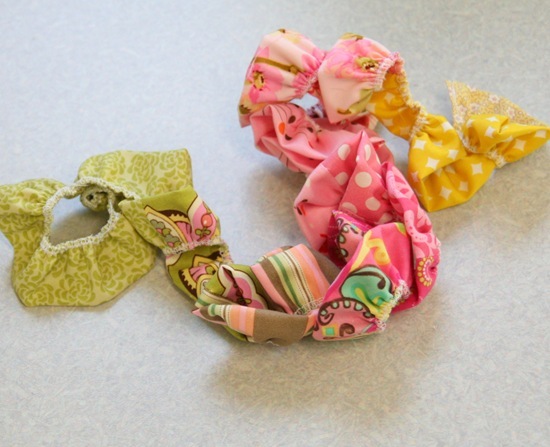 I want to make one to put in my daughter's hair. This is great! I was thinking of putting a flower on a bag, and now I know how to do it w/out having to guess. Super cute! Love your cardigans too! It's so pretty! Thanks so much, I'll be linking. I love this! I am having a linky party on my blog and Flower Week May 24th. I hope you'll come by and check it out. This is super cute Allison! I'm going to link to it on Sew What. i really like the white one. Hi! I am featuring this on my blog for Flower Week. Thanks for linking! Very cute! 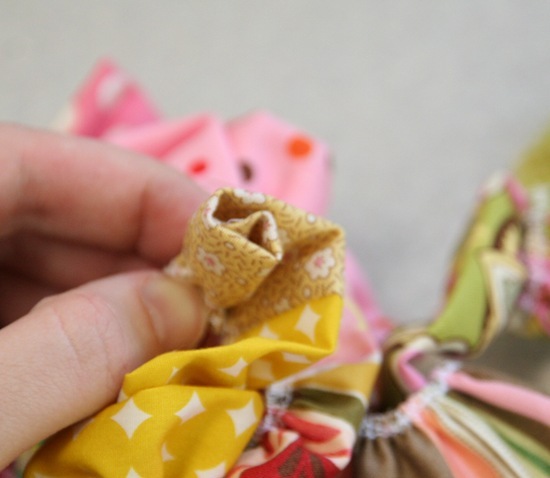 I'm making a little girl's dress right now and that would be a perfect little accessory….I'm thinking headband flower or something in the hair. Thanks for sharing! I am a new follower right back at you!!! I love your blog and have no idea why I haven't seen this tutorial before! I LOVE it! and can't wait to try this! Thank you! 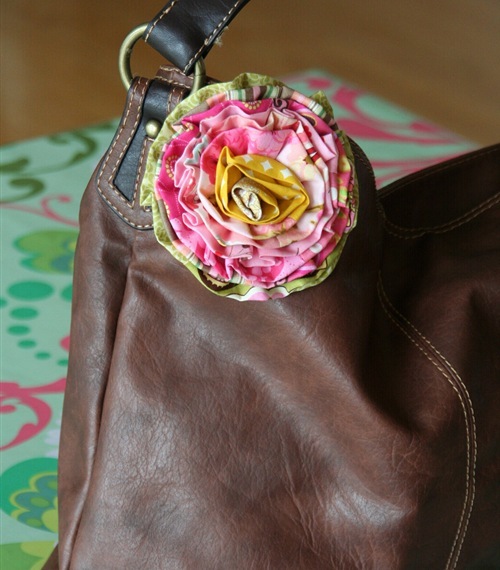 Such a cute way to use scraps. I've got a few ideas on how to use them after they are made. Thanks for sharing. LOVE! I'm going to make a few to put on headbands, hairclips and pin backings. Thank you very much for posting this tute! And I forgot to mention – if you don't have a ruffling foot, you can use lastin (clear elastic) to get the ruffling effect too! These are gorgeous! I will have to try one out after finishing my first quilt! 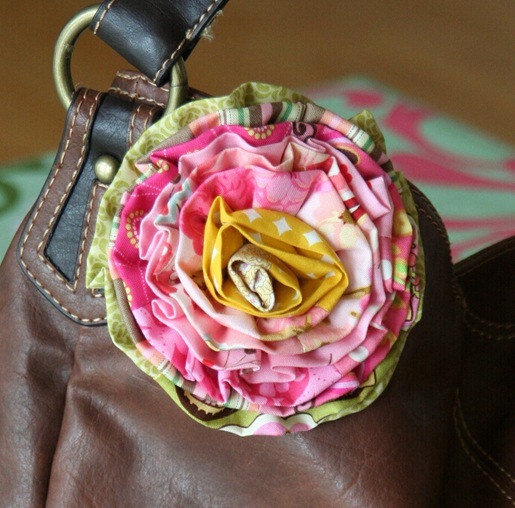 I came across this wonderful tutorial yesterday and spent this morning blissfully creating my first fabric flower. I love how this flower has a finished edge, yet isn't hard to make. What a great way to play with color and use up some scraps in the process. I am definitely going to make more. Thanks, I'm going to make some of these! My first thought was "NO WAY.,, I have no interest in doing something that detailed". But, as I scrolled through the EASIEST looking instuctions….even to ME…. my mind started scrolling with ideas for this cute cute creation. I have been making tons of flowers lately and I think I will be making some of these. Great tutorial…love it! This is just what I was looking for to make a camera strap cover. It will be a great embellishment! Really nice tutorial, I made a nice flower from it. Thank you for the tutorial. It´s so cute. I post it in my blog. We are working on about 100 of these right now at my house. 50 for the 2nd grade market at my daughter's school, their lesson in economics. Just as many being made for baby shower party favors. Oh my! I love, love your Brooch*- thanks so much for the tutorial- these would make some great little Christmas gifts in my Kate Spain 12 days of Christmas fabric- many thanks! Love all your tutorials- so many great ideas and so little time! Beautiful! I wonder if you could make a solid color flower, but bind the edges with another solid color. 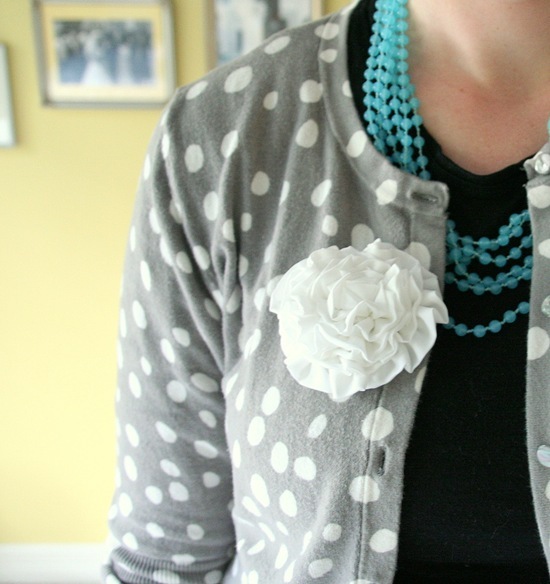 Or, two different patterns, polka dots and stripes.? Visiting from Burlap & Blue — adorable rosette! I've pinned to my "SEW Cute" board, and will def be making this! Love it Thank you for sharing. I just made the flower as a topper for a bridal shower. It's perfect. Thank you for the nice instructions. Thsnk you so much for sharing. Love it.